If you've been an investor for even a couple of years, I'm sure you've seen this quote trotted out willy-nilly. It's brilliant in its simplicity, and true to its intentions. Of course you'd like to hold a stock forever... well, at least until you're ready to sell it for a massive payday. You see, Warren Buffett can survive on his salary of $100,000 because he owns so much equity in blue chip dividend stocks, which pay him up to $622 million a year! Now, it's easy for a billionaire like Uncle Warren to say 'hold forever', but for individual investors like you and me, the truth is a bit more murky. So what makes a stock worth holding forever? There are thousands of dividends stocks to choose from. So where does an individual investor start? In my opinion, those stocks are the mighty “Dividend Aristocrats”. And right now, those are the stocks that I am comfortable owning, even if the market goes through a serious correction. This index is comprised of S&P 500 companies that have raised their dividend each and every year for at least 25 years. The Index is split across 10 business sectors and highlights the ones that have been profitable enough over two-plus decades to reward their investors with ever-increasing dividend payouts. 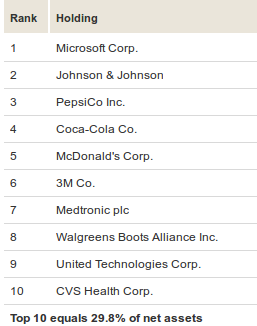 The list is chock full of the usual suspects: Coca-Cola Co (NYSE: KO), Exxon Mobil Corp (NYSE: XOM), McDonald’s Corp (NYSE: MCD), and Wal-Mart Stores (NYSE: WMT) to name a few. All of those companies have been no-brainers over the long haul. But there are some lesser-known companies on the list that are great for building and most importantly — diversifying — your portfolio, including Maryland's hometown heroes McCormick & Co (NYSE: MKC), T. Rowe Price Group (NASDAQ: TROW), and Stanley Black & Decker (NYSE: SWK). These are all great additions to a long-term dividend portfolio. But while Warren Buffett has the luxury and resources to analyze each and every stock purchase to the bone, some of us just want a few stocks to buy and hold, without having to watch them day in and day out. If you are one of those people — God knows I am — then you can easily get exposure to the entire index. If you'd like to get easy and cheap exposure to Dividend Aristocrats, there are Dividend Aristocrat ETFs that can deliver the goods in short order. Since we've been talking Buffett, let's focus on an ETF from a company that Buffett has been most bullish on: Vanguard Dividend Appreciation ETF (NASDAQ: VIG). It actually takes the Dividend Aristocrat model and opens it up even more. While the S&P 500 Dividend Aristocrat Index is the pinnacle of dividend-paying companies, there are many other very consistent yearly dividend increases coming from other companies. Using a similar index but with a 10-year instead of a 25-year track record opens up a way to increase the overall yield by reducing the expense ratio. The Vanguard Dividend Appreciation ETF is a passive ETF designed to track the performance of the NASDAQ U.S. Dividend Achievers Select Index. This is a weighted index, and the ETF will roughly hold the same proportions as it does. It is worth noting that the index is not limited to NASDAQ exchange-listed companies. In fact, a vast majority of held stocks are NYSE-listed. The fund has diverse exposure to individual companies and sectors alike, as you can see here. In total, 186 companies are currently held, with a median market cap of $59 billion. VIG holds about $27 billion in assets and has a thre month average volume around 700,000 shares. With the size and popularity of VIG, the share price rarely strays beyond a penny or two from the net asset value, and the bid/ask spread is always very close. 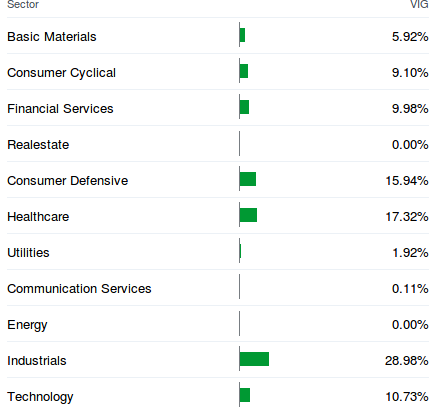 One thing in particular to note is that this ETF holds larger positions in some companies, and the index skews towards the industrials and consumer sectors. The combined dividend yield tends to be higher than the S&P 500 average, and has reliably returned over 2.1% through quarterly distributions this year. VIG sports an ultra-low 0.1% expense ratio thanks to the very large total assets it holds, along with the simple portfolio management it requires. That an easy 54% more money than you had before - and that doesn't even count the 2%-plus yield you'd be cashing in each quarter. So there you go: plenty of safe, dividend-yielding plays to get you started as a true aristocrat. And you don't even have to own a monocle or wear a powdered wig. For an even more complete guide to high quality dividend stocks, click here.